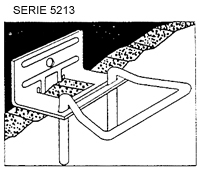 This assembly is for mechanical anchorage to the backup over drywall or through rigid insulation. Needs only one screw to carry the total load while the second screw gives 100% backup protection, vertical and horizontal adjustments with no out of place movement. The anchor is available to accommodate 0", 1", 1½", 2", 3", 3½" insulation. The metal stud fixations #325, #326 and #327 are available on request in mill galv., hot dipped galv. or (16 g.) stainless steel material. Made of a 14 gauge (2.0 mm) steel plate, 4” wide, A & B dimensions are required for price estimations. Used with a #206 triangle, the vertical adjustment obtained is 3” (75 mm). The male part is made of wire of 3/16 " (4.43 mm) diameter. Same finity available (Mill. Galvanized, hot dipped galvanized or stainless steel). Standard dimension 3 ¼" of projection. Vertical adjustment of more or less 1 ½ " + 1 ½ " = 3 " (75 mm) if installed over or under.